Motherwell captain Peter Hartley struck a dramatic late leveller at Fir Park. Gerrard's side have conceded late equalisers twice in their opening three league games. PETER HARTLEY RUBBED salt into Rangers’ wounds as the Motherwell captain’s last-gasp equaliser rescued a 3-3 draw against the club he was forced to apologise to. It looked like Ovie Ejaria’s goal just before the break would send Rangers on their 4,600-mile Europa League round trip to Ufa on Thursday in confident mood, only for Hartley to pounce with the last kick of the game. Gerrard took the chance to road-test a 3-5-2 formation as Jon Flanagan joined Connor Goldson and Nikola Katic in a new-look three-man back line. But it took just three minutes for Johnson to net for Motherwell. Goldson slipped on the greasy surface and Allan McGregor’s footing also went, leaving Johnson to lob over the stranded goalkeeper into an empty net. Rangers levelled on 16 minutes as Hartley could only clear a Barisic cross to the edge of the box, where the Northern Irish striker was lurking to slam home with the aid of a big deflection off Richard Tait. Yet Rangers were behind again within two minutes as Gael Bigirimana lined-up a free-kick from deep, leaving McHugh to loop a header over McGregor. Rangers hit back again on 38 minutes when Tom Aldred did not spot Lafferty cutting across him and was powerless to stop the big frontman nodding home. Gerrard’s men took the lead two minutes before half-time when Carson allowed Ejaria’s strike to dribble into the net. But the visitors were less dynamic after half-time and paid the price in the fourth minute of stoppage-time when Hartley lashed home from Bigirimana’s delivery. Email “Steven Gerrard's Rangers drop more late points after conceding 93rd minute equaliser”. 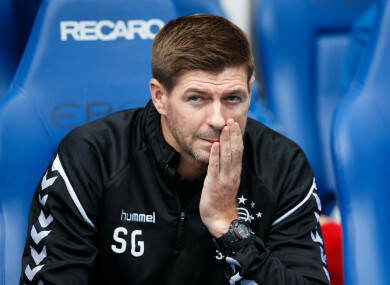 Feedback on “Steven Gerrard's Rangers drop more late points after conceding 93rd minute equaliser”.